Locally some know me as a Real Estate Broker from my 14 years in real estate while others know me as Stefanos dad/manager/producer. Some of you may even know me from my work on my business and Stefanos’ websites as well as my participation on the Genesis community forums. No matter how you know me, or however you found me, I’m glad that you are here. My name is George Alexiou and I have created this site. If you’ve been around me enough or get to know me, you’ll notice that I have a passion for real estate, music and creation. 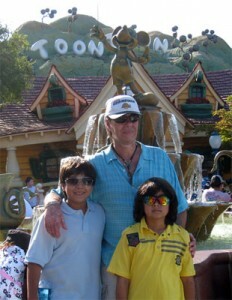 I’m lucky enough to have been happily married to Lynne for 25 years and have two boys, Stefano and Alexi. When I’m not out looking at properties or working on real estate contracts, you’ll either find me on my phone or in front of a computer talking to people about my future rock star, making videos or producing his music. Often I’ll be in front of a computer for hours at a time making changes to my and Stefanos websites. I have been designing my own websites since the early FrontPage days back in 1998 when I first created an e-shop for my business needs at that time. In 2001 I created my first real estate website also using FrontPage and then in 2004 I “graduated” to Dreamweaver & Photoshop to design my current real estate site. In 2006 I started using WordPress as a companion to my site to add a Blog and I designed a custom WordPress Theme in Dreamweaver to match the look of my regular site. Then in mid 2007 after realizing the power of WordPress as a CMS I decided to convert all my real estate sites into the WordPress platform and designed my custom Themes in Photoshop & Dreamweaver. Soon after that I discovered Brian Gardner’s amazing Revolution Themes for WordPress and early in 2008 I decided to purchase the Developer’s pack and start customizing the themes for all my site needs. Soon after that Brian created StudioPress, became partner in Copyblogger and the Genesis Framework for WordPress was born. For the next couple years I kept using the custom Revolution themes for my real estate sites since I was happy with the work and their performance while I created a site for Stefano, who in the meantime had become a bit popular from his YouTube videos customizing one of the new Genesis themes. I kept going back and forth between customizing Genesis themes and the old custom Revolution themes I had designed for the real estate sites until Genesis 2.0 featuring HTML5, mobile responsiveness and Schema.org markup arrived at which point I customized the new Genesis Pro themes for all my sites. My carrier from my early years as a Sonar tech has help me to hear the sounds of the music and be able to help my son with producing his songs. While I’m managing and producing his songs and videos, for a while I also managed and produced “SoZo Led”, his Led Zeppelin Tribute band before breaking up due to the luck of effort from his adult band mates. By the way for those of you who haven’t had a chance to see or hear Stefanos, several industry “experts” have called him the future of the guitar and the “one” that someday should be on the same conversation with today’s and past great guitarists. Wow! I hope to live long enough to see that, assuming that his passion for music will stay the same as it is today!